If you’ve been following us on Instagram, you’d have come across our contest which a 100 engaged couples won. We wanted them to have an opportunity to interact with the two most important vendors in any wedding: photographer and makeup artist. So that’s exactly what we gifted them - a pre-wedding photoshoot and a complete bridal makeup session with Delhi’s leading artists! Ananya Rijhwani, Taaniyah Seyth, Albummed, Snapsoul, and The Wedding Frames handled the photoshoot with their brilliant photography while Anchal Batra, Akansha Soni, Pooja Khuraba, Isha Khanna and Shubhangi Theran held an interactive makeup session for all the brides-to-be. Here, Callista Resort serves as a stunning venue with it’s plush interiors and dramatic landscape. The hospitality here was very warm, with the staff being very courteous and made the couples very comfortable. The interactive makeup session by Anchal Batra, Akansha Soni, Pooja Khurana, Isha Khanna and Shubhangi Theran at Vivanta by Taj, was held bearing in mind every bride's beauty dilemmas. Makeup is one of the most important things for any bride-to-be and there are a million questions in her mind regarding the same especially when it comes to booking her HMUA for all her wedding functions. We gave our brides an exclusive insight to not only interact with some of Delhi's most celebrated makeup artists, but also to watch them in action as they transformed one of our winners into a bride! They all had an opportunity to ask the real professionals about all the makeup hacks, tips and more with real feedback and answers. How amazing is that! We understand that managing and planning an Indian wedding is anything but easy! So to handle the big day in a hassle free manner, we introduced our couples to the WedCraze App. WedCraze allows you to manage your guests and keep them updated about everything in real time. It serves as one platform for you to share key info, all your guests to share photos, get to know each other, have an itinerary of the wedding events and much more. Read more here. What’s more, is we had Pretty Secrets and Enn Closet collaborating with us! Pretty Secrets gifted all the brides-to-be a goodie bag with the cutest little things in them. Adorable pink lingerie, vouchers, cute eye masks and a tote bag were included. We got some amazing reviews for each of the items. The lingerie was both cute and comfortable - perfect for a long day! And the sleep masks of course, were a much-needed item they were glad they got. The brides simply loved it and we did too! Enn Closet, gifted organic lipsticks for all our brides to be. Now a wedding is never easy on the wallet and we’re well aware of that. The tiniest of things do add up! Well, as always, Weddingz.in came to the rescue. We made a list of all the things that newlyweds need help with keeping in mind grooming, bridal wear, honeymoon and even post-wedding furniture. 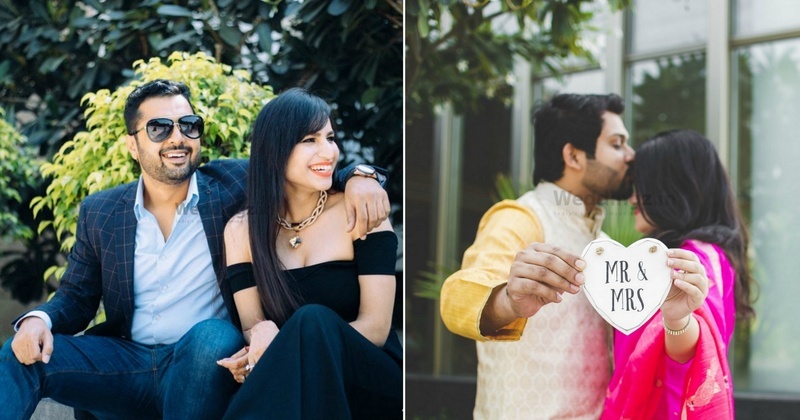 We gifted them the Weddingz Amazing Offers vouchers with great discounts and offers from huge brands like Make My Trip, Meena Bazaar, Flipkart, City Furnish, Urban Ladder, Vior etc.Read more here. We also included a wedding checklist to help with all the planning - A step by step guide, teaching them to prioritize their tasks according to the time left for the wedding. The response was overwhelming with couples coming back to us and telling us that we made the process of getting married so much easier for them. We’re over the moon about how this turned out and are sure to keep hosting more! Stay tuned and watch out more amazing contests!